ARO will be introducing its EXP Series 3 inch non-metallic diaphragm pump for the first time at ACHEMA 2018.
International manufacturer of products for fluid management in industrial operations, ARO, a brand of Ingersoll Rand, will be introducing its EXP Series 3 inch non-metallic diaphragm pump for the first time at ACHEMA 2018. 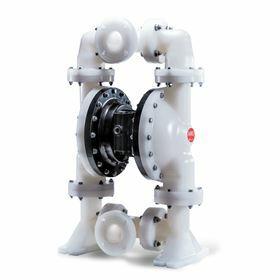 ARO is expanding its portfolio of air operated diaphragm pumps and the new EXP Series 3 inch non-metallic model will be making its debut at ACHEMA 2018. The company will also use virtual reality demonstrations to showcase its pumping solutions, filters, regulators and lubricators (FRLs). Highlights at the ARO Stand will include the new EXP diaphragm pump and the EXP series of diaphragm pumps with electronic interface capability. The new EXP series 3 inch non-metallic diaphragm pump is designed for high volume transfer in industrial, chemical processing and water treatment applications and offers a longer diaphragm life due to slower cycling. It is also compatible with harsh chemicals that require a gentler stroke to prevent damage to fluid that can happen with smaller capacity, high-pressure pumps. The EXP series diaphragm pumps with electronic interface capability eliminate potentially inaccurate manual processes and replace them with automated processes for batching and filling applications in markets such as chemical processing, paint and ink formulation, waste water and more.